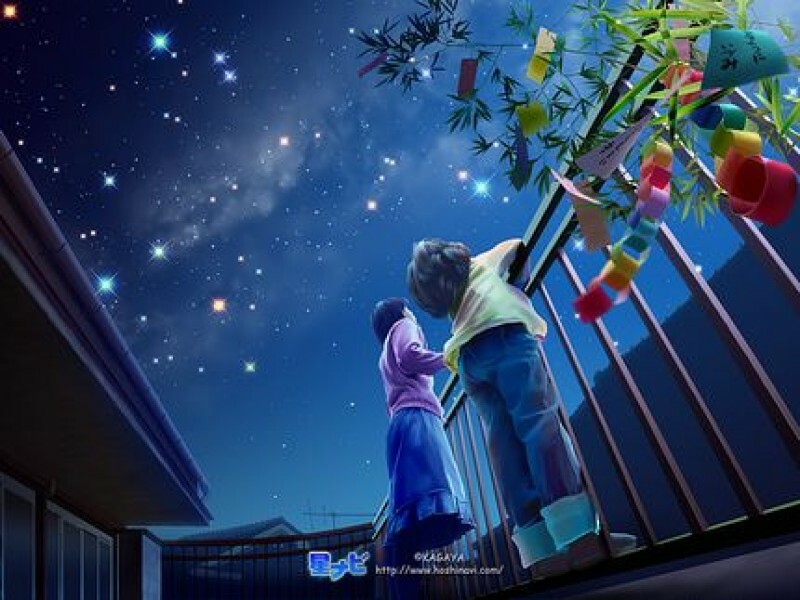 The 7th of July is Tanabata (七夕/ the star festival) in Japan. Starting with mikoshi, Japan is preparing for the summer. We are counting down. 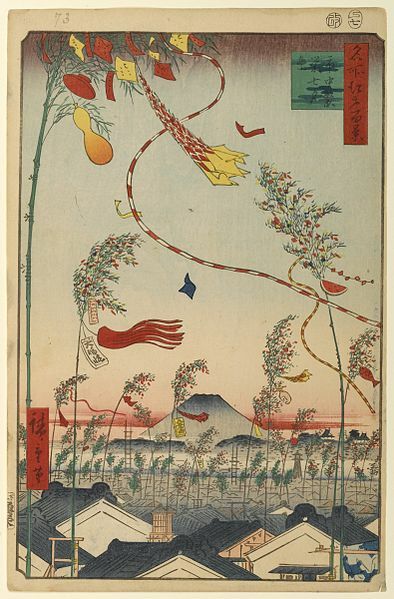 Tanabata is a Chinese origen mythology and is the only day two young people, Hikoboshi (彦星/ Altair) and Orihime (織姫/ Vega) can cross the Amano-gawa (天の川/ the Milky Way) and see each other. 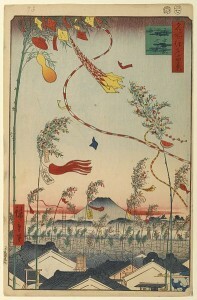 According to the mythology, Orihime is a daughter of the Emperor and she weaved such a beautiful materials. One day, the Emperor found her a good young man, Hikoboshi who lived the other side of the Amano-gawa then these young two got married. Since they got married, Orihime was too happy to be around Hikoboshi and stopped weaving. The emperor was angry and brought Orihime back to the other side of the rive. Now they are separate and sad. 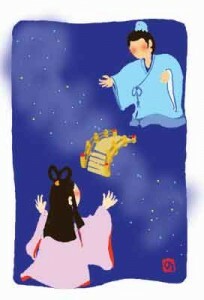 The emperor felt sorry for his daughter and promised that if Orihime works really hard, once a year, the 7th of July, he allows her to cross the Amano-gawa to see her husband. So during the year, these two young couple worked so hard, counting the days until they can see each other. 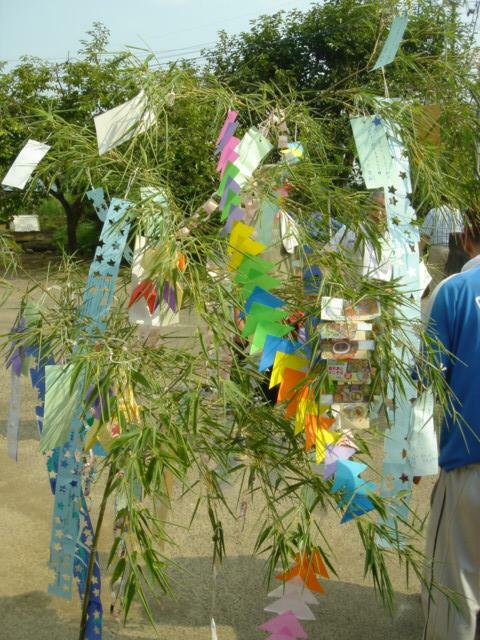 In Japan, we decorate bamboo leaves. This custom started in the Edo period and is original event in Japan. 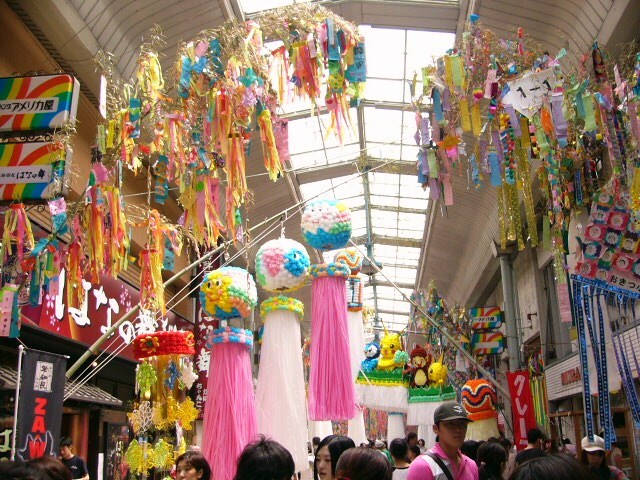 One of the most famous Tanabata festival is in Sendai. After the quake, I was actually worried that they wouldn´t be able to do it but NO. This year, they will put all big summer events in Touhoku together and hold a massive summer festival in Sendai to cheer people up. I think it´s a really good idea. So now, how do we decorate bamboo? We make decoration with colourful paper, loops, some patterns then the most important thing about Tanabata is you write your wishes and hang them from the branch. They are bamboo, not those chunky ones but thin ones and those are called “sasa (笹)”. Then you think carefully of your wishes. Here are the example, let´s see what they wish for. Then you don´t need to learn how to speak. That´s not up to “him”. 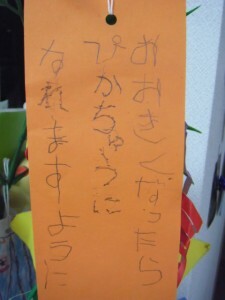 Now you know how important to make wishes for Tanabata. During this time, many local high streets are decorated with bamboo and it´s quite lively. I remember when I was in the nursery, my mum took me to a walk to the park in the evening. 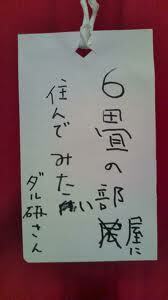 I was put in yukata (浴衣/ summer kimono) and I smelt like baby powder as I always had a heat rash. We took our bamboo branch. I was a little confused because the water in the river was very low and didn´t seem to carry the bamboo to anywhere. But as my mum insisted, I finally threw it over the bridge. I wanted to know if this was normal or even people still do it anywhere in Japan. As I´ve found was, it was a tradition to throw the bamboo into the sea but now because of the environment matter, it´s prohibited. Well, it´s logical. Imagine entire Japanese citizen throw the bamboo trees away into the local river and the sea. So now, in some regions they pile the bamboo up and burn them, instead. It´s OK, sounds like a bonfire. 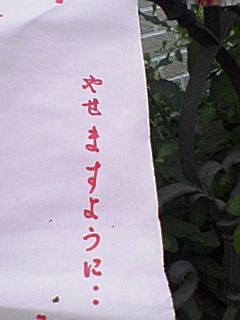 This is the song for Tanabata. The title is “Sasa no ha, sara sara (笹の葉さらさら)”. Oh, here there is another onomatopoeia we need to look up soon. 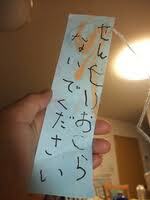 Tomorrow is the Tanabata. Don´t foreget to make wishes.